The Goalkeeper Coaches at J4K Surrey are full time Professional Goalkeeper Coaches,their only concern is developing goalkeepers. J4K Surrey have had a keeper selected for ENGLAND! Scroll down to see some of our success storys! Matt started playing in goal when he was just 8 years old, and quickly become one of the best keepers in his area. At the age of 11 Matt signed for Brentford were he stayed for 5 years. After being released from Brentford Matt signed for Ryman Premier league club Ashford town were just after five months playing in their first team, Premiership clubs Charlton and Chelsea came in for Matt. Matt picked to go on trial with Chelsea and was there for half a season were he trained with the likes of Frank Lampard, John Terry, Zola etc and was within touching distance of a professional contract but was released because of his height. From there he signed for conference team Woking before moving to the conference south team Hampton and Richmond we he won a league and cup double. Matt has coached and is coaching pro and semi pro goalkeepers from South Africa,USA,Canada,Australia,Slovakia and Spain to name a few. Every week Matt works with pro or semi pro keepers on all aspects of their games and Matt works with them to prepare for trials. Matt has been approached by 2 pro clubs but due to his massive commitment to J4K and the J4K goalkeepers has turned them down. Matt runs a sponsorship system via J4K Surrey and www.thegoalkeepergloveshop.co.uk. He has sponsored over 100 goalkeepers ranging from under 7 keepers right up to international goalkeepers. If you would like sponsorship please contact Matt. Below you can see that Matt has helped many goalkeepers with their development Matt has had a J4K keeper selected for ENGLAND, Matt has helped ALSO lots of his goalkeepers move into pro clubs 2 being Chelsea and Brentford. With J4K Surrey growing, a lot of the J4K venues are so well attended and goalkeepers stay committed to the sessions that J4K Surrey has waiting lists for our venues Matt also runs goalkeeper camps in the half terms and summer holidays which always fill up fast so if you are looking for a goalkeeper camp in Surrey please email Matt fast. Matt is also one of the head coaches at the J4K international residential course and has seen and helped many goalkeepers from this course move onto pro clubs. Matt is now starting to coach with J4K in the USA with our ID camps. From above you can see Matt sponsors a lot of goalkeepers in the UK and worldwide but he also gives alot of FREE equipment and FREE coaching to goalkeepers in grass roots football, over the past year matt has given back up to £2000 to grass roots goalkeepers. Another Just4keepers keeper Conor Hudnott signs for Chelsea and is progressing on very well, Conor joined j4k in December 2010 and brought a fantastic attitude to training, always willing to learn and always training hard Conor took this hard work and great attitude into games and he was picked up playing for his local team and signed for Chelsea at the beginning of April 2011 as an U14 keeper, this season obviously U15 & pushing to be included in U16 squad on occasions. Training very hard but enjoying immensely under the tutor ledge of Mark Beeney & his team. Matt I would just like to thank you on behalf of Conor for your excellent coaching sessions that helped him achieve this first step towards his dream of becoming a pro goalkeeper, thank you Simon and Conor. J4K Surrey is very proud to bring you news about J4K Surrey Coach Cameron. Cam is currently on a 3 week tour in India with Crystal Palace. Cam is also part of Uxbridge United Goalkeeping set up. Johnny recently had a training session with Roy Hodgson and Ray Lewington in aid of a local charity. Johnny also currently plays for Surrey Schools U13 squad. We found a picture of Jack from the Summer with J4K hat and gloves and the under 10s winners trophy from a tournament in Merstham, when he only conceded 2 goals across the 9 games including the final. And he’s continued to improve since then, his reactions, positioning and technique have improved so much he just seems to have more time and be more comfortable. It takes something really good using the full size of the goal to get anything past him these days. Thanks for all the hard work with him, he’s so much more confident in himself these days. Many thanks to you and H (Bisley) for you input and time. Matt, I would like to thank you for the incredible work you have put in to keep Max at the top of his game. He is in his 6th season as part of the Woking Academy, Woking retrial for selection every season and Max is still there No.1 keeper for his age group over the 6 season period. This is mainly down to the superb sessions you provide for your keepers on Monday nights at Esher Rugby Club and during the off season the highly recommended residential camps in various places around the country. Max has thrived under your tutelage and this has benefited Woking FC. Hopefully he can progress through Woking to achieve great things like two other famous keepers Ross Warner and Robert Green who passed through the academy. Former J4K Surrey Goalkeeper now Usa Scholarship Goalkeeper Luke. Luke Joined J4K for over 1 year and with hard work and J4K goalkeeper training he was signed by Hampton and Richmond Fc and this year took up the offer of a USA Scholarship, J4K Surrey now helps Luke with goalkeeper glove sponsorship. J4K Surrey Goalkeeper picks up golden glove award Josh has been attending goalkeeper coaching in surrey now for 6 months and has improved very well under J4K coach Matt Nash J4K goalkeepr Josh last night receiving golden glove 2011/12 for Bedfont Sports/Eagles. He had the best ratio/performance of all keepers at the club. 20 league games, conceeeding 19 goals and 8 clean sheets. Josh is 1 of loads of J4K goalkeepers attending goalkeeper coaching in Surrey, who have won awards this year for their displays. If you would like goalkeeper coaching in surrey or more information about J4K Surrey please contact J4K Surrey today. Well Done Josh, keep up the hard work. This is the professional goal keeping school that Josh goes to twice a week and it’s both extremely professional and works very hard to find a common ground with all the kids regardless of their ability. Matt Nash runs it and you could not meet a more dedicated individual whom’s goal is always to ensure keepers of all ages progress. I would like to personally recommend Matt Nash who is working with my 11 year old son. My son is currently in the Fulham FC Development Squad. Matt is a goal keeping coach who really knows his stuff. He coaches in a way that kids really response to and enjoy. J4K Coach Matt Nash, Route one at its best. 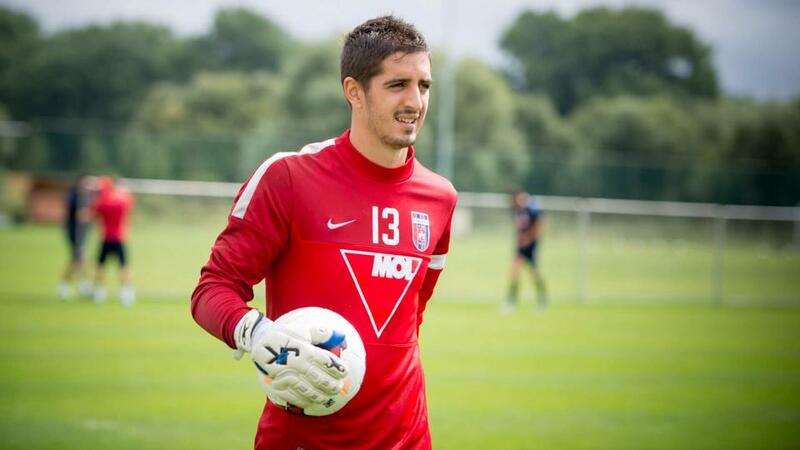 Here is just a few keepers we sponsor filip pajovic – FC Videoton, Hungary is sponsored by www.thegoalkeepergloveshop.co.uk If you would like to be sponsored by The Goalkeeper Glove Shop please click the above link.